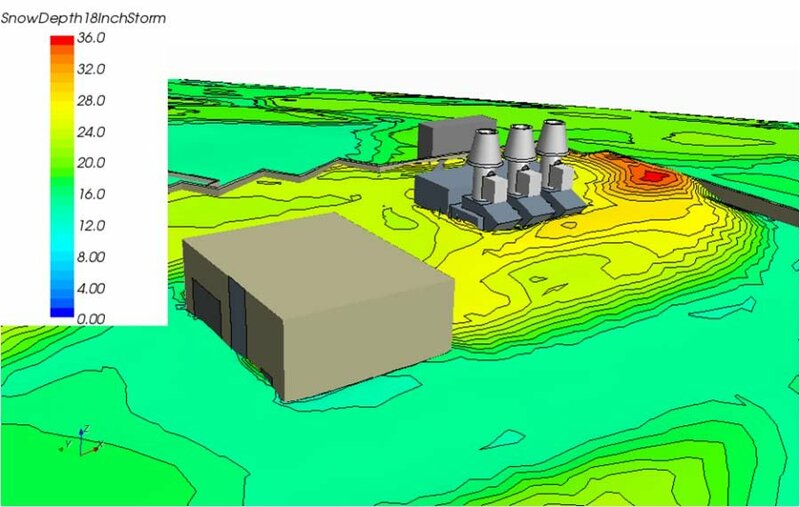 Many of our clients wish to have a wind study performed for their projects. Various methodologies are at the disposal of engineers and architects to evaluate the interactions between the buildings they design and the exterior environment. 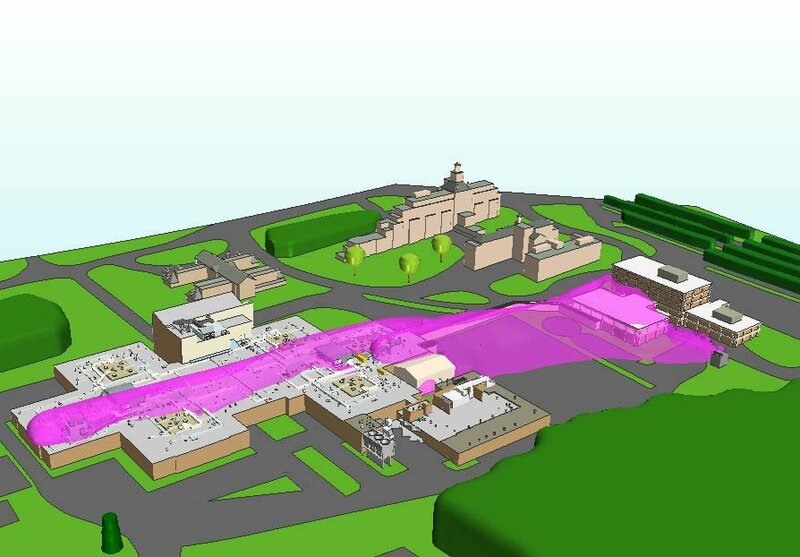 In addition to CFD techniques, the other methodologies include relatively crude hand calculations like those outlined in the ASHRAE Fundamentals, several commercially available software approximations using Gaussian solvers (e.g. - AERMOD® or CALPUFF®), some Lagrangian software packages such as AUSTAL®, and scaled models in wind tunnel studies. CFD offers several advantages over the competing methods. For instance, CFD solves for the actual physics involved in a domain rather than simply approximating the physics. CFD provides the ability to use heated surfaces such as roofs, parking lots, or building walls and simultaneously use ambient air temperatures that are different from the surfaces. Further, CFD allows the user to define hot, cool or neutral temperature discharges from stacks and will account for natural temperature variations, turbulence and wind speed as a function of elevation. The CAES Group of M/E Engineering employs proprietary techniques to adjust wind speed profiles with rolling topology and incrementally change the wind direction (or speed) into one transient run, essentially creating a virtual wind tunnel. Once the model is built, it is simply stored on hard media indefinitely unlike the physical models used in wind tunnel studies that may require warehouse space. Finally, CFD techniques are significantly less expensive than wind tunnel methods and can be built or changed much quicker than physical models. 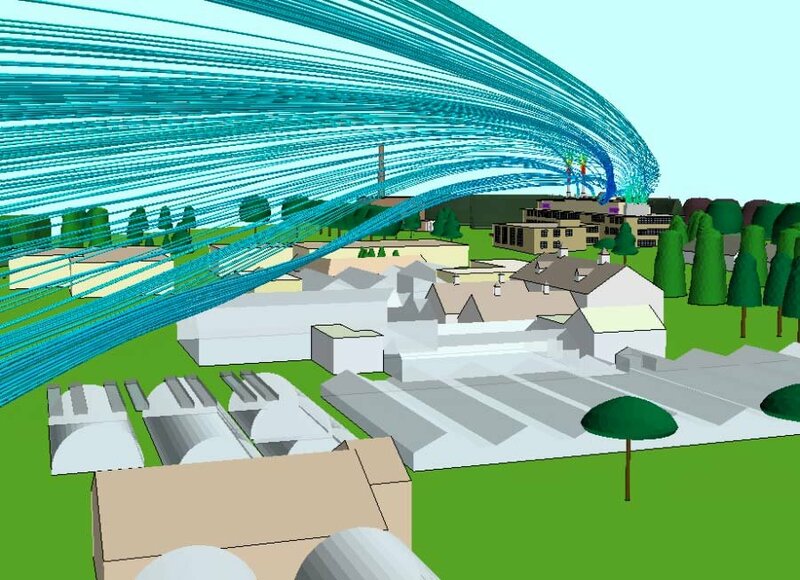 The results from CFD wind models are highly intuitive and can show a broad array of solved variables such as wind velocities and patterns, dispersion of numerous chemicals simultaneously, temperature profiles, wind pressures, and even the depth of snow drifting during a snow storm. 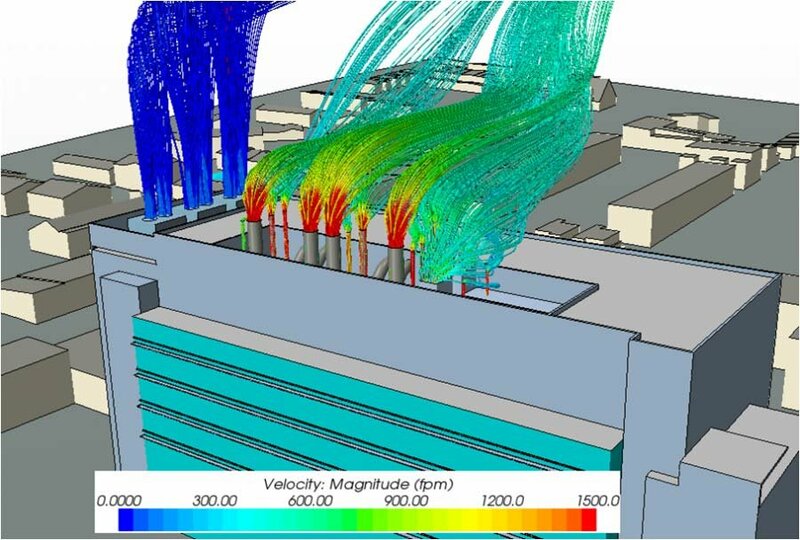 CFD analysis providing a cost-effective, visually intuitive alternative to wind tunnels and other techniques. Determination of the dispersion of emergency generator exhaust, boiler exhaust, cooling tower mist, or nuisance odors to sensitive areas. 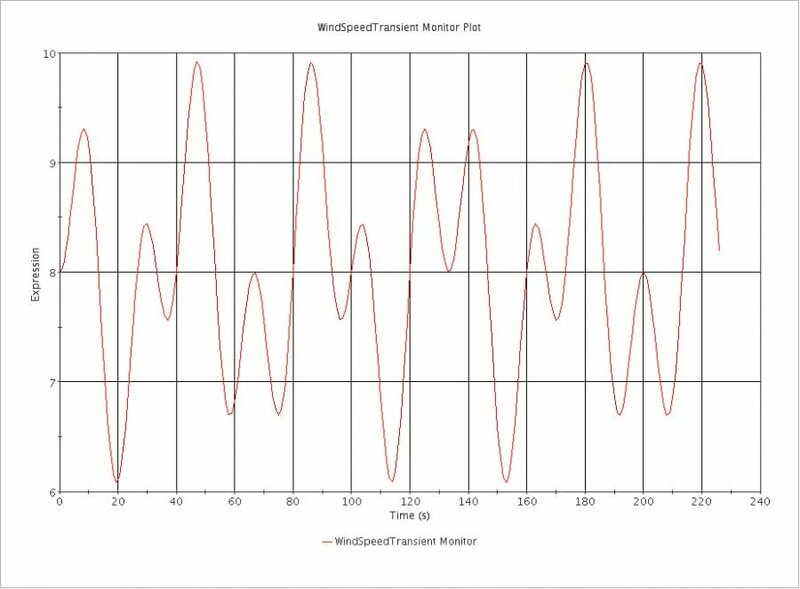 Calculations of wind flow fields and wind pressures on and around a building or several buildings. Emulations of snow drifting during a typical snow storm including the accumulated depth and weight of the snow. Finding the efficacy of various rooftop stack designs in terms of throw, dilution and reentrainment potential. Determination of the ash dispersion and concentrations from wood fired boiler plants or incinerators. Provide supplements to environmental impact studies and code compliance. Chemical, biological and radiological threat assessment based upon wind patterns.